The HSLG is the perfect Automatic Gate Opener for the Industry that is looking for a powerful work horse of a gate operator. 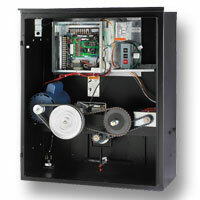 The HSLG can be used with 115v single phase up to 460v three phase operations. 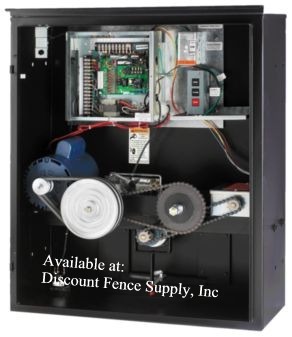 This slide gate opener can open a gate up from 20 feet up to 55 feet depending on the type of gate you are using it on. There are different maximum gate weights depending on the horse power you choose. For example the ½ horse power opener can open a gate weighing up to 900 lbs. were as the 1 hp. can open a gate up to 1500 lbs. See Automatic Gate Opener Specification below for further information. For a quick look at a reference chart look see our automatic slide gate opener chart selector or swing gate chart selector. We quarantee the lowest price! Double-slide-Two Operators required- Slave capability is built in. Automatic gates are not for pedestrians! Electric Gate Openers are designed for vehicular traffic only. They are powerful, and can cause serious injury or death. Accordingly, direct all pedestrian traffic to a separate pedestrian gate. UL325 Requires the use of contact of non-contact anti-entrapment devices.